One of the most exasperating things that happen to Retail and Technical Traders is to find a chart with a perfect setup, but the stock has already gapped or run up with a huge one day gain. High Frequency Trading algorithms triggered the running or gapping of the stock up, in the first few minutes of the trading day. Many traders want to learn how to capture these gains, and be in the stock before a huge gap or big run day. 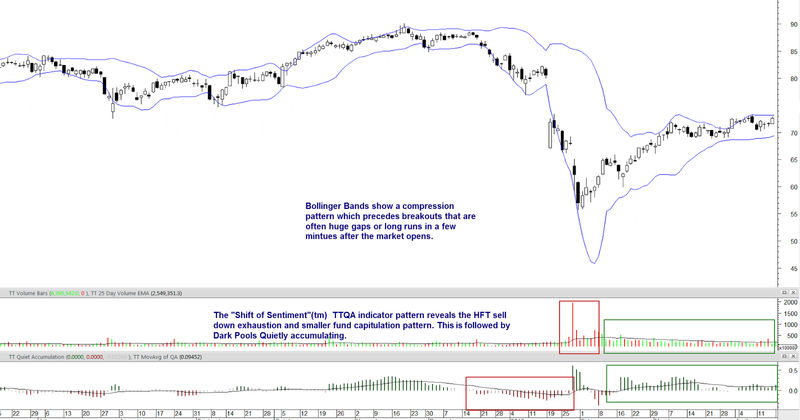 Bollinger Bands are the best Channel Indicators for Technical Trading, and for finding Breakout Compression Patterns prior to gaps or runs. The ability for the bands to expand and contract makes the bands the ideal channel indicator to use. However as with ALL Channel, Price, and Time Indicators they require additional indicators for directional signals. 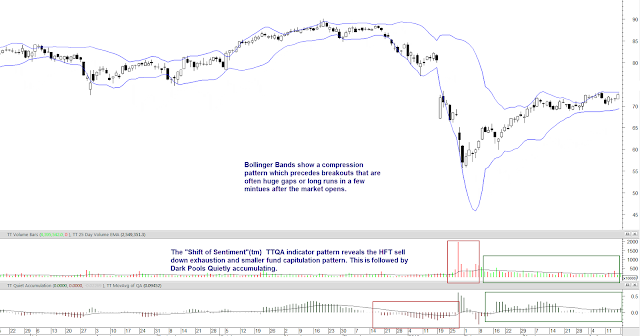 Bollinger Bands tell you that the stock is poised for a strong Momentum Run or gap, but do not tell you whether the Breakout will be to the Upside or Downside. During Trading Range Market Conditions such as we currently have now, it is impossible to “guess” the Breakout direction solely using Price and Time Indicators. Employing Quantity and Value Indicators provides the complete set of indicator analysis to determine the direction of the Breakout when using Bollinger Bands. When trading Options this eliminates the need for Options strategies that buy both a Call and a Put because the trader has no idea what direction the Breakout will go. When trading Stocks it eliminates the risk of whipsaw action, or assuming that just because the Indexes are down that the Breakout will be down also. This is especially helpful during Bottoming Market Conditions when stocks frequently retest prior bottom lows. Quantity Indicators reveals the slow Quiet Rotation™ and Quiet Distribution, and Quiet Accumulation patterns by the giant Institutions. The TechniTrader Quiet Accumulation TTQA Indicator was designed for MetaStock users for this purpose. Quantity indicators are used by Professional Traders regularly but are rarely used by Retail Traders. There are both line and histogram Quantity Indicators available. Volume Oscillators are also seldom used by Retail Traders. These offer a significant advantage over Price and Time Oscillators, which tend to give false signal during Momentum Runs, Velocity Runs and other fast moving price action that exceeds the parameters of the Price Oscillator scaling. The Flow of Funds Indicators are another group of indicators that help determine direction of a Breakout. Often time Smaller Funds and Independent Investors are selling, as the giant Institutions are quietly buying the same stock hidden from view on Dark Pool venues. These types of indicators show whether money is flowing into or out of the stock. By incorporating additional indicators into the stock analysis, Retail and Technical Traders can significantly improve their trading profits by identifying the direction of the Breakout prior to price suddenly moving with momentum, a gap, or velocity action caused by HFT triggers. Quantity and Volume Indicators are easy to interpret, and provide the missing data for a complete stock pick analysis during sideways patterns. For Options Traders this is a far more useful analysis than traditional Options Indicators, and it can lower contract costs by providing the missing data needed to choose the proper contract and Option strategy. Copyright ©2016 Decisions Unlimited, Inc. dba TechniTrader. All rights reserved.